At least Eight houses were washed away by massive landslide caused by incessant rainfall at Barbara village in Jang circle. As per preliminary assessment all the household properties and belonging of the residents of the said village including one Maruti car and one pulsar bike were also completely damaged. Machineries and equipments M/S Alliance Trading being in used for construction of Thingbu road have also been washed away. Though no casualty were reported three persons sustained minor injuries. The formation of Marmang Thingbu road at Sumrang village, two number of culverts and one suspension bridge have been washed away as a result of which Thingbu circle is cut off from rest of the district. Rescue operation headed by ADC Jang started early in the morning with the help of ITBP, SSB, police and locals. The entire village have been evacuated to Jang as a precautionary measure to avoid loss of life and immediate relief in both cash and kinds have been provided to the victims. Meanwhile, Honble Chief Minister Sri. Pema Khandu has expressed shock over the unfortunate incident and has directed the District administration to provide medical aid to the injured persons and immediate relief assistance to the victims. Further he has asked for early formation of board for loss assessment the in order to decide future course of action. 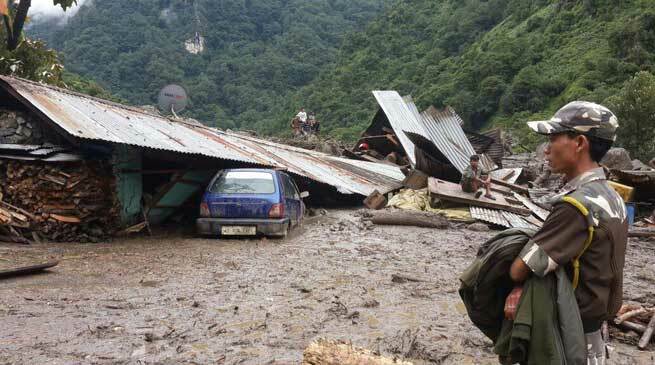 The informant Shri Dorjee Tsering a worker of Alliance trading will be awarded with bravery award for his appraising of bravery during the landslide. He inform all residents about the landslide in due time which result saving many lives.